Learn about how to get set up with our Salesforce integration. We cover what can be synced and how to do it. The SalesForce Integration with Planhat is a powerful way to get your customer data into Planhat, as well as push out any customer data from Planhat into SalesForce to make sure your technology systems and divisions (sales, marketing, leadership ...) are always on the same page with up to date insights. In this set-up guide, we will go over what types of data can be synced, how to sync them, what the syncing process is like, and how you can make adjustments to your SalesForce <-> Planhat integration settings. 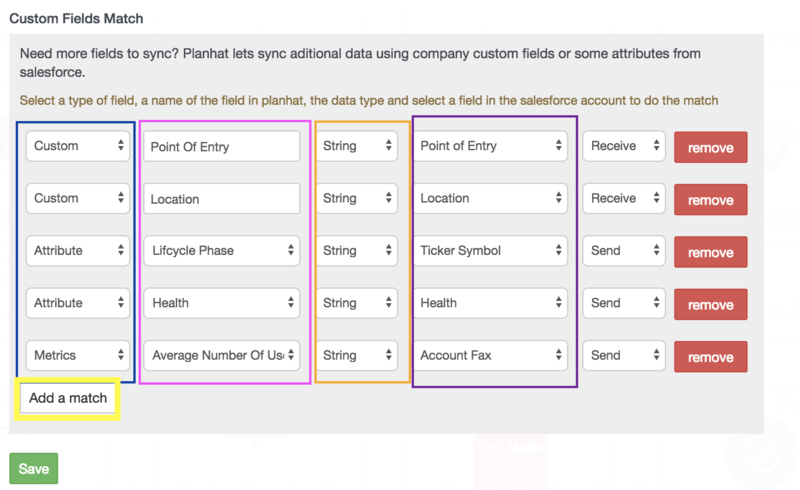 Before you can get started with syncing your data into Planhat, you need to make sure that you have the correct settings in Salesforce to allow the data to be synced. Within Planhat, click on "Connect with Salesforce"
A new window in the browser displaying the login page of Salesforce (NOTE: If there is already an active session it will not pop up but you have to find that browser tab). Salesforce will ask for your permission to allow the connection with the application. Click Allow. At this point, the Salesforce integration is active, but still not sending or receiving any information. Next, configure what you would like to keep in sync and other details here within Planhat. This message is from Salesforce and it means that having their API is not a part of your current plan with them. You can upgrade your plan with Salesforce to have access to the API. The API is required to connect with Planhat. After you have successfully connected Salesforce to Planhat, you can move on to getting your settings setup! The sync between SalesForce and Planhat is bidirectional, meaning you can choose to push data to, and pull data from each system. You have the ability to choose how you would like each of the objects and fields to be synced. You will be able to specify, per category, how you would like (or which direction) the data to be synced between SalesForce and Planhat. 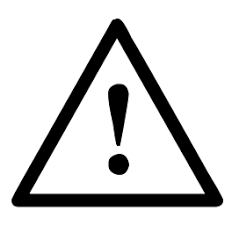 **For safety, regardless of direction, one system cannot delete objects in the other system, though they can be updated. 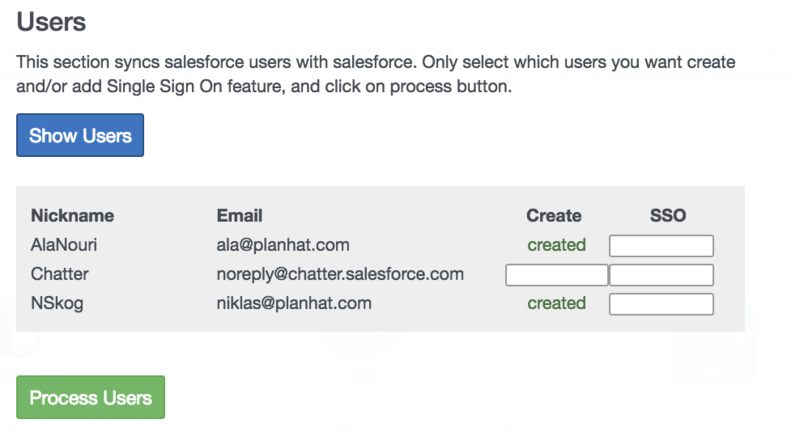 First, you need to select which users you would like to create from the Salesforce account in Planhat. To add a user, click the white process bar under the column "Create"
After it says the user has been created, select Process Users. First, decide how to sort out how new customers are created in Planhat. 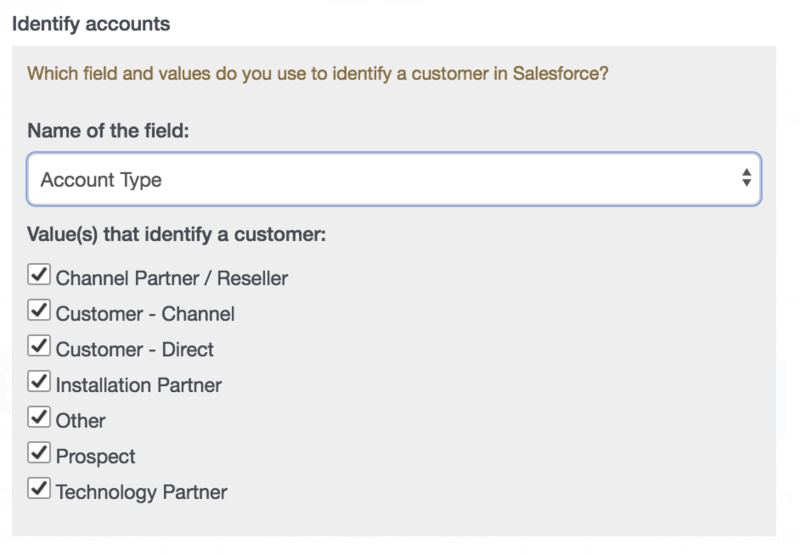 Most of the time, we will want to sync both data from your own system (if you have a separate system where you're keeping customer data and also connecting it to Planhat), and data from the corresponding account in Salesforce. For this to be possible Planhat should know both the external ID in your system and the Salesforce ID (see step 3). It is important to note that what is called an Account in SalesForce is what will create a Company/Customer in Planhat. Select which accounts you would like to sync. To this by selecting the type field and the types of values that identify which accounts you want to sync. 3. Specify where the external ID from your own system is stored in Salesforce. You do not need to specify anything with Planhat externalID. 4. Choose if you would like to sync the Salesforce account owner or not and if you would like them to enter a default lifecycle stage in Planhat. In addition to creating accounts in Planhat (or in some rare cases in Salesforce), the account level sync is a powerful way to get Success metrics and custom data from Planhat into the account card in Salesforce, for example, customer health score and other KPIs. (BLUE) You can choose to sync a Custom Field, an Attribute, or a Metric. Attributes and Metrics are objects in Planhat that you can push to Salesforce, so you can only send the data. Custom Fields are objects from Salesforce that you can sync into Planhat, or do a bi-directional sync to and from Salesforce to Planhat. (ORANGE) Choose whether it is a string / number / date / boolean. (PURPLE) Pick from the drop-down menu which objects in Salesforce this information will be coming from (the options you have in Salesforce will appear here). Again, you choose which direction you would like the data to sync. Add a Match, is for each time you would like to add an additional row. And remember to select Save. The objects you have selected for Planhat to Receive will appear on each company overview in the left menu along with other customer data. This section is pretty quick and simple to sync. 1. You choose which direction you would like the data to sync. 2. Custom Fields are optional. An Attribute is information from Planhat that you can only send into Salesforce. Custom is information from Salesforce that you can send, receive, or choose both directions. Again, remember to Save all of your changes. 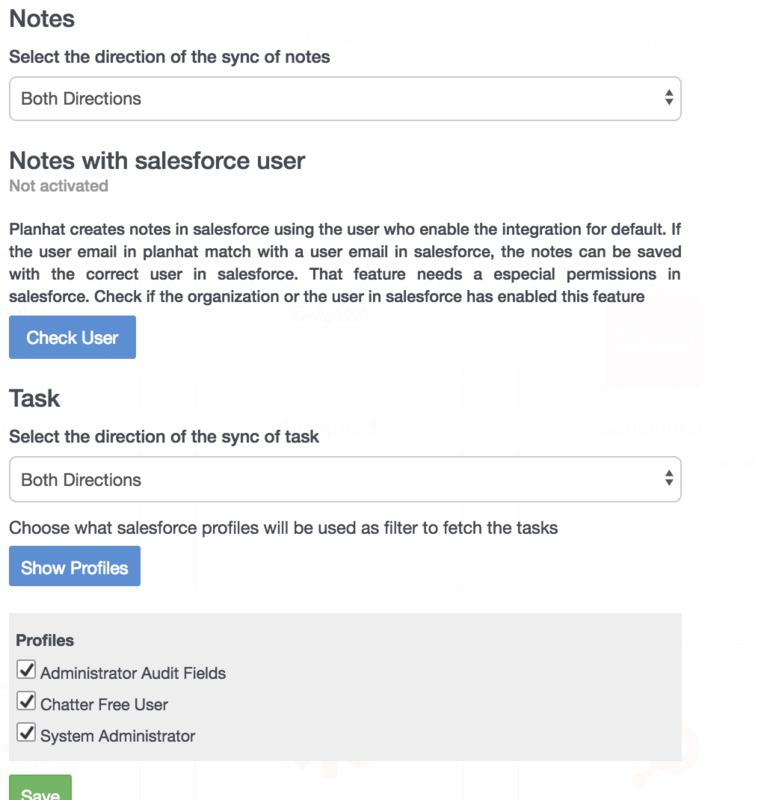 If you use the "notes" section on your accounts in Salesforce and would like those to show up in Planhat, or have the notes you create in Planhat appear in Salesforce, then you can sync these as well! 3. Show Profiles under Tasks allows you to choose only selected users to fetch tasks for. 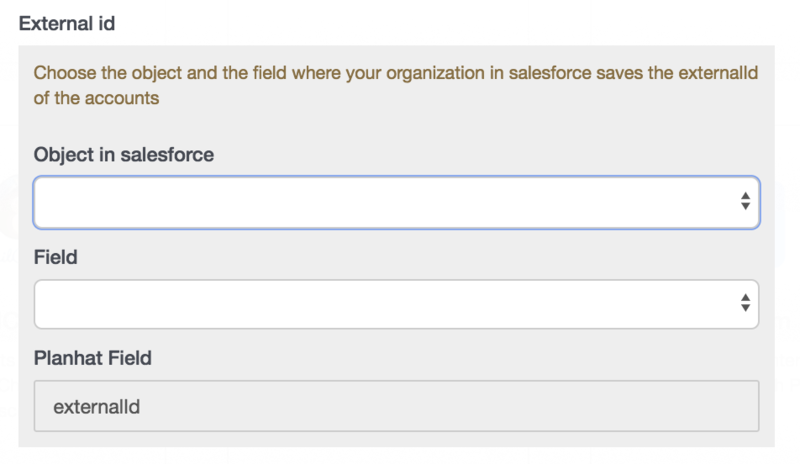 Clicking it will display the users in Salesforce below and you can select which users you would like to fetch tasks for. If no profiles are selected then Planhat will fetch all tasks. When one note is created/updated in Salesforce, Planhat gets and saves that new note in a maximum of 10 minutes. The note fetched will be saved as a note in Planhat. Only company notes will be fetched. When a note is created in Planhat the note will be sent as soon as possible to Salesforce, and it will be saved as a company note in salesforce. When a user creates a task in Salesforce, Planhat will get this task in a maximum of 10 minutes. As a default, all tasks created in Salesforce and sent into Planhat are created as a task, however you can choose to have the mapped as a "call" or "email" as well. When a Salesforce task, that is a call or an email, is completed in salesforce, Planhat gets that task and saves the tasks as completed. This also updates the "Last Touch" attribute of the customer (if the date of the task is more recent than the Last touch attribute currently on the customer from Planhat) and creates a logged activity which is shown in the activity section of the customer. Comments on completed tasks do not sync with the corresponding activity in Planhat. New Tasks in Planhat are sent to Salesforce as a "Task." The task will appear in the task section in Salesforce. When a user completes a task in Planhat, this will also complete the task in Salesforce and this action will appear in the activity section. The log of a completed planned activity will be synced as a note to Salesforce. Save all of the settings you created. If you have your license data stored in Planhat, and if this is where you enter the licensing data and decide to keep track of the licensing data then you can choose to sync this data with Planhat as well. *Important to note: The field you select that contains the subscription information should have at least one field with a relationship to the account (like account_id). If this relationship not exists, or the relationship does not contain an account ID the licenses not will be brought into Planhat. 3. You will then need to specify which fields in Salesforce are related to any additional license information you would like to sync into Planhat. 4. So that we don't fetch all of the license data and try and sync it into Planhat for you, apply a filter that tells Planhat which field in Planhat to sync from, and which values in Planhat mean that it is a license that it should sync. "Salesforce Account with Multicurrency: ON"
The currencies will be created properly by Salesforce, but FIRST, you need to go into your revenue settings and create all of the currencies you have in Salesforce in Planhat as well! Again, always Save after every section to make sure your settings are being stored and the Salesforce sync is successful. We are happy to help you get set up with Salesforce, so simply reach out to us and ask!